The Samsung Galaxy S4 and the HTC One are two of the hottest smartphones on the market today. But which one is right for you? Different people have very different needs and expectations when they purchase a new smartphone. So I've created two lists to help make that crucial decision. The following list spotlights five areas in which the Samsung Galaxy S4 outperforms the HTC One. 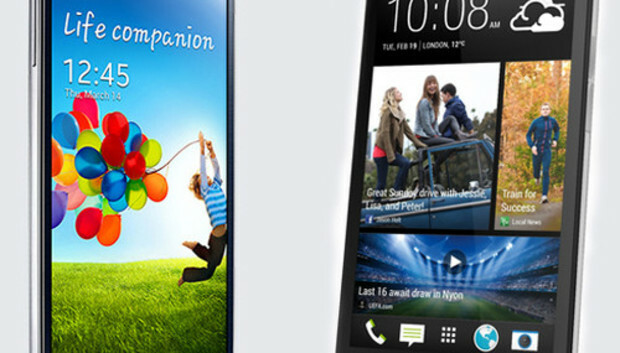 For an opposing viewpoint and a look at some ways the HTC One outperforms the Galaxy S4, read "HTC One vs. Samsung Galaxy S4: 5 Reasons to Choose the One." And for my unbiased opinion on the device that offers a better overall experience, check out my related blog post. One area where Samsung's Galaxy S4 really stands out is its camera. The device offers a ton of advanced camera features and shooting modes, but to be honest, I don't really use the advanced features very often. I'll occasionally use the panorama mode or if it's dark out and I'm in no rush, I'll switch to night mode. But I usually just use the camera on auto mode and snap away. The 13MP rear camera on Samsung's GS4 consistently provides better image quality than the HTC One's 4MP rear camera. Yes, Samsung's GS4 camera has more than three times the megapixels than the HTC One's rear camera. But the truth is, the HTC One's "UltraPixel" camera mostly captures impressive images because it uses a custom sensor and lens system that allows each pixel to capture more light than many other smartphone cameras, including the Galaxy S4. However, while the HTC One does capture better-than-average images in specific environments, it's clearly lacking in others. For example, I brought both my HTC One and my GS4 to Fenway Park and snapped a number of pictures of the Green Monster and other far-away objects and scenes. While the HTC One captured comparable close-up images in bright sunshine, images taken with the HTC One of far-away objects were notably lower quality than those taken with the GS4. Overall, the GS4 provides a better camera experience than the HTC One. One of my favorite things about Samsung's latest Galaxy smartphones is that they feature batteries that can easily be removed and replaced, and they support microSD cards for expandable storage. Both of these things are extremely important to me, in fact, I would not purchase a smartphone without a removable battery at this point. I travel too often to carry a device on an east-coast-to-west-coast trip without at least one spare battery in tow. I don't feel quite as strongly about microSD-memory-card support, but it's still a feature I truly value. The HTC One has a fixed battery, with a smaller total capacity than the GS4 battery, and the device does not support memory cards. Both devices run a customized version of Android designed to make them feel different and distinct from other Android phones. Samsung's version of Android is called "TouchWiz;" HTC's version is "HTCSense." I prefer TouchWiz to HTCSense for one main reason: HTCSense does not let you get rid of its annoying BlinkFeed features, which pulls in news and information to your home screen. That's fine if you want panels that display news and other updates, however, not so good if you don't. As soon as I get a new Android device, I immediately streamline my navigation by eliminating extra home panels and grouping all of my frequently-used apps into folders. I like my Android home screens clean and uncluttered. And I don't like having extra panels that don't serve any purpose and that cannot be deleted. By default, BlinkFeed is your main home panel, and if you use it and find it valuable, it could work well for you. You can set another panel as your main home panel, but you cannot delete the BlinkFeed panel completely. And that's just annoying. There are a number of minor things I dislike about each, and ultimately it's a matter of individual preference, but overall, I find TouchWiz to be less intrusive than HTCSense. Samsung's GS4 has a larger display than the HTC One. (The GS4 screen is 5 inches compared to the 4.7-inch display on the HTC.) The GS4 is more than a millimeter thinner than the HTC One, and it's just slightly shorter, though it's also slightly wider. Both devices are very similar in size, but you get a significantly larger display with the GS4. And the GS4 weighs 4.6 ounces, while the HTC One weighs 5 ounces. With a few exceptions, the GS4 has more impressive hardware specifications than HTC's One. Most notably, the GS4 has faster 1.9GHz, quad-core Snapdragon 600 processor, compared to the One's 1.7GHz Snapdragon 600 quad-core processor. The GS4's larger display is composed of Corning's latest Gorilla Glass 3, while the HTC One's display is made of Gorilla Glass 2. Not only does the GS4 have a removable battery, but its 2,600mAh battery pack is larger than the HTC One's 2,300mAh battery. For the reasons listed above, and many more, Samsung's Galaxy S4 is a quality smartphone that's sure to please a lot of buyers. But it isn't perfect. Click on over to the companion piece to this story for five reasons why you might want to choose the HTC One instead of the GS4. Or jump right to my conclusion to see which device I would pick if I had to choose just one.